Ok but for a thank you, last hurrah etc type song a bit dull and average. Doesn't have the euphoric feel and sentiment of say Take That 'Never Forget' which is essentially the same type of song from a boyband. The video could have shown a lot more also, their global impact, awards, early footage etc but is also just a bit dull and flat. The UK chart run for such a bland track is mad. Best British Video at The Brits, 2017. 14th UK top 10. 8 weeks UK top 10. 36 weeks in the UK top 100. 12 weeks Canadian top 100. Canada#46. 6 weeks US top 100. US#65. 740,000 copies sold in the UK. 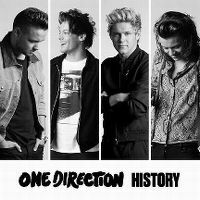 The biggest selling boyband single of 2016 in the UK.